With a stunning selection of runs spread across its three peaks, Sölden continues to attract visitors year after year. Based in the breathtaking Tirol region of Austria, the resort offers magnificent runs, spectacular views and amazing customer service. It doesn’t matter if you’re a skiing connoisseur or new to the sport, Sölden is a great place to get started and find an exhilarating new way to keep fit and explore sensational winter terrain. Thanks to the geographical position of the resort, travellers can expect beautiful blue skies and brilliant snow coverage, while there are plenty of excellent facilities to enjoy across the resort. If you needed any more convincing, the area’s amazing scenery meant it was used as a filming location for 007: Spectre back in 2015. While the terrain may be the most important factor for many visitors, the resort also boasts enough facilities to keep visitors entertained while they’re away from the slopes. This can be especially difficult for families with children, who will be sure to find fun things to do in the resort, including the ALMZEIT trail, which is a themed trail designed for young children. It connects mountain huts in the area to runs on Solden’s western flank and boasts interactive play areas. Along with the fantastic ski conditions, visitors can venture to some of the mountain huts within the resort to enjoy some authentic Tyrolean music and explore the culture of the local area. The ski season in the area runs from December to April with extraordinary coverage available to ensure the best possible coverage for skiers and snowboarders. There are 2 glacier ski areas at Rettenbach & Tiefenbach ensuring excellent snow conditions and snow making systems cover 76% of the ski area. With staff regularly visiting the slopes to ensure they are maintained properly, you can expect fantastic conditions across the resort. With runs for beginners, intermediates and experts, there is plenty of variety to choose from across the area. There is a strong variety of different runs available to choose from across the area for beginners, intermediates and experts. You can look forward to high alpine terrain and 70km of off-piste runs, along with downhill runs starting at 2000m high. For beginners, the Hainbachjoch route is sure to be popular alongside the Giggijoch region, where there are several runs designed for those new to the sport. For intermediate runs, HochSolden may be the best place to visit and ski classes are available for those wary of taking on more difficult runs. On the other hand, experts can look forward to HochSolden, where you can expect a challenging ride with outstanding views. When it comes to admiring the scenery of the area, perhaps the best vantage point is the top of the Tiefenbachbahn gondola, where an astounding panorama of the surrounding glaciers and mountain scenery awaits. Getting around is easy thanks to the efficient transport system in the area, helping visitors to make the most of the resort and develop their skills. Solden has transformed in recent years from a lively resort to a more sophisticated ski area. While there are still nightlife options for travellers, it’s now easy for families to get involved in the fun throughout this magnificent region. You can stop off at one of the cosy mountain huts or umbrella bars for a peaceful drink, with Gampe Alm, Fuchsloch and Halli Valli all offering fantastic service and a great opportunity to mingle with locals. When it comes to food, Solden has a variety of excellent restaurants including Salino and Giggi Tenne, where Italian and international dishes are served respectively. If you’re feeling tired and worn out after a day on the slopes, you could even visit one of the many health spas in the resort, including Michaela Mader Physio and the Das Central massage parlour. Sölden is a fun town but it’s not the prettiest place. We would recommend the resort to a family with older children. There are lots of attractions and activities to do in Sölden, including the Aqua Therma Centre (Langenfeld by bus), ice skating and a 5km floodlit toboggan run. Plus, look out for scenes where they shot James Bonds Spectre! The ski range has 3 big viewing platforms that you can visit with amazing views, all above 3000 meters with mountain views for miles. For the adventurous families, you can get a one day upgrade on your pass to go to Obergurgl. 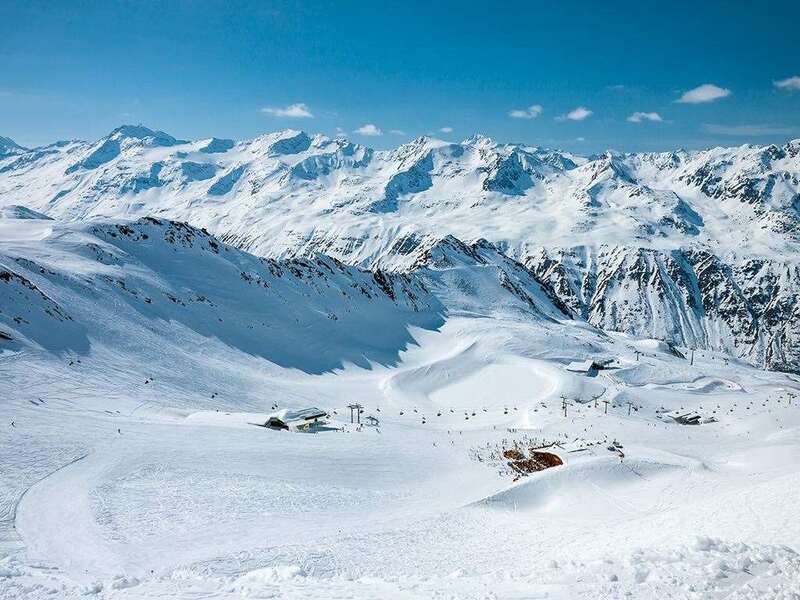 There is fantastic skiing in Sölden with reliable snow due to high peaks and access to glacial skiing; this will give you confidence if you’re a group leader selling this resort to a large group. There’s no shortage of après ski venues, bars and nightlife hot spots in Sölden. If this is an important aspect of your ski holiday trip then you’ll be returning back to Sölden year on year! The closest airport to Solden is Innsbruck which is about 80 km away. I have just returned from a fantastic week in Solden. Solden town is split-level and is spread over a large area with the 2 main gondolas at each end. The main bars and restaurants are situated near the gondolas so everything is well located. There are regular buses that run up and down the main street allowing quick access between both gondolas and to neighboring towns and ski areas. I would definitely recommend taking the bus (15 minutes’ drive) for a ski-away-day to Obergurgl & Horchgugrl (which is included with lift passes for 3 days or more). Make sure that you have a few drinks at the Nederhutte apres bar in Obergurgl before getting the bus back to Solden. The ski area in Solden is mainly suited to intermediate and advanced skiers as there are many red runs and ‘extreme’ blue runs. 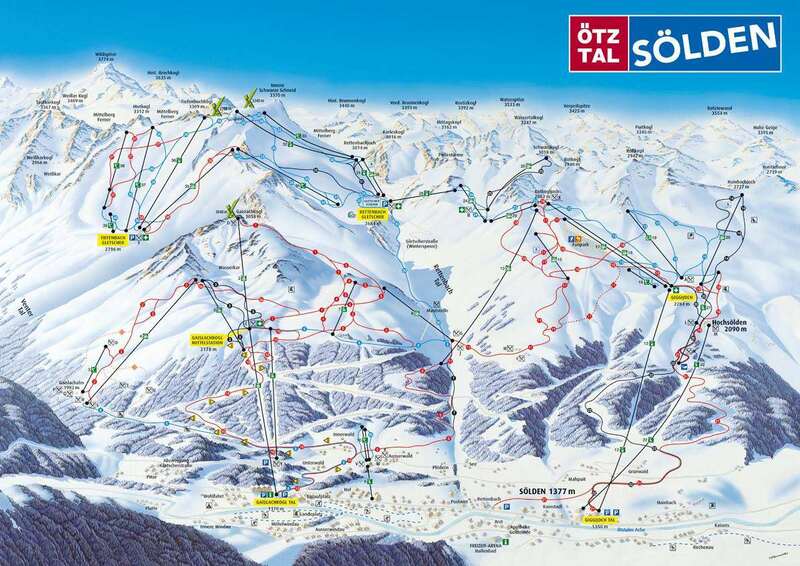 If you are a regular skier or snowboarder, you will love Solden - the ski area is really varied with lots of high altitude ski areas and snow-sure slopes. The snow was still great at the end of March! I would love to go back and hire an off-piste guide as the ski area is extremely extensive. The ski area is suited well to snowboarders with barely any flats so you won’t have to unstrap when you don’t need to. The facilities and restaurants are all fantastic, Solden has heavily invested in the infrastructure so many of the lifts are fast and there are plenty of bathroom stops and rest areas around the mountain! My top recommendation would be to go for a drink in the IceQ bar at the top of the Gaislachkogl lift station as this is where they filmed the latest James Bond film Spectre. There are incredible views from the bar and the perfect spot for a great photo. If you haven’t done a ski holiday in Austria before, Solden is the perfect choice for your first try! Just got back from Solden and absolutely loved it. We were a bit concerned about the amount of skiing to start with as the area is stated as having 150km of piste. We Normally ski in areas with a minimum of 300km but if I did not know the size of the area then I would never have guessed. There are 3 main peaks and 2 glaciers and once you are right in the thick of it all the area seem huge. Everyone in our party opted to pay the extra 10 Euros for the upgrade on teh lift pass to get a days skiing in Obergurgl and it was well worth it. It opened up an extra 100km of piste and was well worth visiting for a ski away day as it only takes 15 mins on the free local bus. Definitely worth doing to break the week up. Another top tip is to check out the Solden Aqua dome. It is not actually in Solden (technically it is in the little village next door) but it is amazing. The spa facilities are some of the best that I have ever experienced and it is open late so you can go after skiing and sit in the thermal pools surrounded by snow under a star light sky. The nightlife is Solden was fantastic, loads of bars and late night venues to choose from. Cooke bar at the bottom of the Gigi gondola was always lively for an apres ski drink. I definitely would not hesitate to go back to Solden.